I have seen many questions that are asking "How to install / upgrade". There are many tutorials out there, so they obviously haven't bothered to do much research - they've just asked over here straight away. I will reference this question, they don't have a problem installing it, they simply want a tutorial. I will reference this one (other has been closed and I don't have a screenshot of it). Should this be flagged and or downvoted or answered? That one question fits the definition of too broad, you will need to write the equivalent of a book to start answering the question. Also, I would downvote it, it doesn't show any research effort, and it's unclear. Seriously, there's just too much wrong with that question that isn't worth anyones effort. Forward them to the one how to install question a lot of them are forwarded to. And downvote. Or don't. 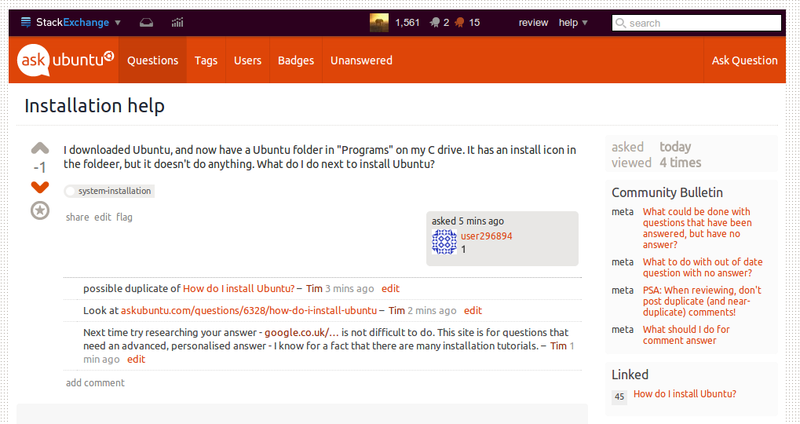 The question looks like posted by a person who has no knowledge of Ubuntu. He/She was trying to install Ubuntu on a windows machine and the question is the genuine one that comes to the mind of a person who have no idea of what to do next. And most people fail to find a correct answer on-line first time when they try. Not the answer you're looking for? Browse other questions tagged discussion scope tutorials . Is it appropriate to ask if the Asus X555MA has any known issues running Ubuntu?